Terry and wife Deb strike a familiar pose. ...to author and screenwriter Terry Davis's website. Best known for his award winning novel, VISION QUEST and its film adaptation starring Matthew Modine, Davis has been a writer and educator for more than 30 years. Retired from teaching in the MFA program at Minnesota State University in Mankato, he now lives in Mankato with his wife, Deb Halverson Davis. He continues to write works of traditional fiction, essays and screenplays, including an adaptation of WHALE TALK by his good friend Chris Crutcher. 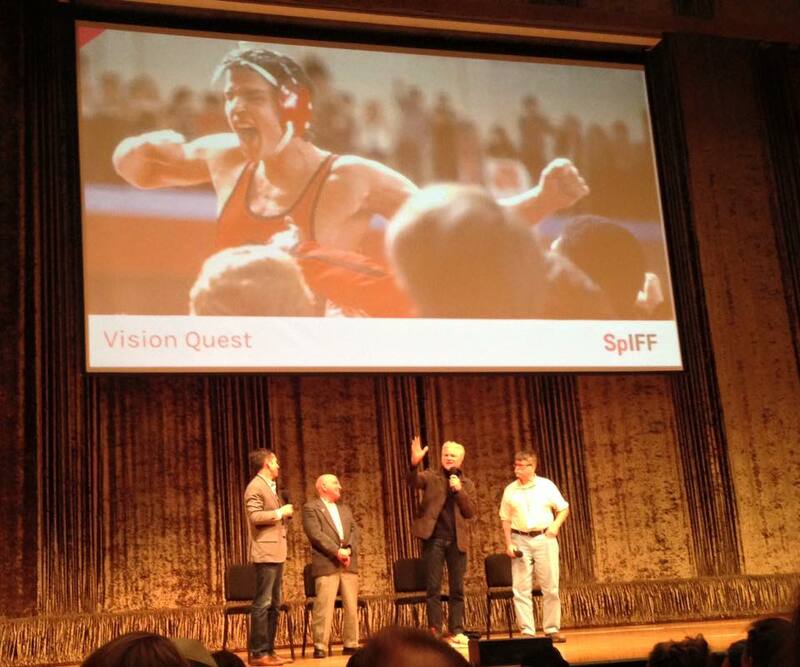 Spokane International Film Festival celebrated the 30th anniversary of VISION QUEST with (left to right) Jess Walter, Cash Stone, Matthew Modine and Terry Davis on January 30, 2016 at the refurbished Fox Theater in Spokane, WA. 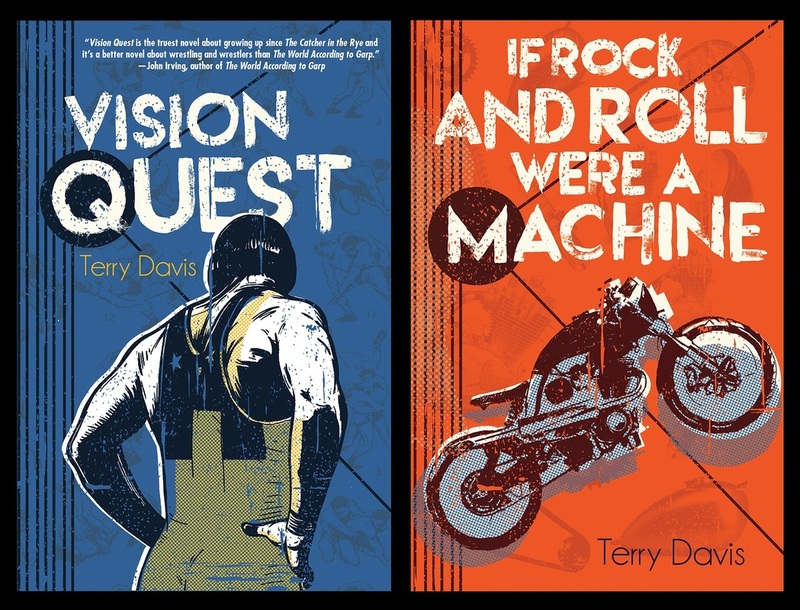 Legendary editor David Gale at Simon & Schuster joined forces with Terry Davis to republish his modern classic Young Adult novels, VISION QUEST and IF ROCK AND ROLL WERE A MACHINE. Both books are available NOW from S&S in hardcover, paperback and e-book. Terry Davis joined forces with Patrick Jones to contribute a work of fiction to the upcoming Mammoth Book of Jack the Ripper, available now, December of 2015. Read more about it here. 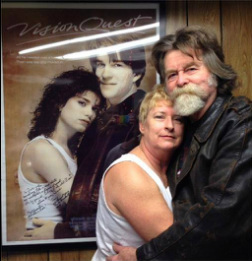 ...offers a brand new 2015 interview with Terry Davis in celebration of the anniversary of VISION QUEST. Check it HERE. ​Don't miss "The Paper Bombs" by Terry Davis at Pif Magazine HERE. ...features Terry Davis's short story, "Paper Bomb" in their Spring 2014 edition. Check it out HERE. ...featured Terry Davis's story, "Canis Mythicus" this month. You can explore that short story HERE. ...features a new, original story by Terry Davis called "Atheist in a Foxhole." You can read it HERE. ...of the Eastern University Press publications of VISION QUEST, IF ROCK AND ROLL WERE A MACHINE and MYSTERIOUS WAYS. If you'd like to buy a copy of any or all of these rare books, contact Terry Davis at terrydavis46@gmail.com. ...published by Chronicle Books in January of 2012 is a collection of "he said/she said" story pairs, including a duo by Terry Davis and Rebecca Fjelland Davis. Other authors featured include Chris Crutcher, Kelly Milner Halls, Joseph Bruchac, Cynthia Leitich Smith, Terry Trueman, Rita Williams-Garcia, Ellen Wittlinger, James Howe, Sara Ryan and Randy Powell. ...featured Terry Davis's outspoken contribution to the Intellectual Freedom edition of VOYA Magazine, edited by Rosemary Honnold. Freelancer Joel Shoemaker wrote the feature, NINE YA AUTHORS TALK ABOUT INTELLECTUAL FREEDOM (pages 18-25 of the digital issue available HERE). Davis was one of the nine. "I'd have to give the most credit for mentoring me directly to young adult novelist Terry Davis.He was literally been my writing mentor for both my bachelor's degree and my master's degree in English. I learned from him directly and owe a lot about how I approach writing to him.For example, it was Terry who helped me realize, in my early twenties, that I could admire Stephen King and his writing without having to write the same sort of stories, or the same genre..."
It's possible, according to reports from E! and other online sources. TWILIGHT star Taylor Lautner (Jacob) would play the new Louden Swain. Who might be his older woman? It's anyone's guess, but read more about the possibility HERE. ...are classics written by H.G. Wells. Davis adapted the stories for outstanding graphic novels for Stone Arch publications. Read more about them HERE andHERE. "Last week I was presenting at the Young Writers’ and Artists’ Conference in Mankato. One person I had to make sure to see was Terry Davis, author of Vision Quest. He was one of my fiction writing professors at MSU, M. I actually helped him clean out a pole shed of old motorcycle parts (he also wrote If Rock ‘n’ Roll Were a Machine, a story about a teen getting his first motorcycle). My reward for all the hard work (right)." UPDATE: In the spring of 2014 Terry Davis suffered another blow to the head and was rushed to the hospital. Once again, he fought back and is now recovering in Spokane. Without a doubt, Davis had nine lives. He may be down four or five now, but that leaves a few left to wander. PREVIOUS ACCIDENT: The facts are clear in this photo from the Mankato Free Press (by Pat Christman). Terry Davis LIVES! Released from St. Mary's Hospital, he is back in Mankato working hard to rehabilitate his body and his mind after a fall from a ladder threatened his life in January 2012. For an update on his recovery and his state of mind, read the article by Robb Murray HERE. To send Davis a get well wish, post on the Facebook page dedicated to just that end HERE. To read about the Spokane Film Festival and actor Matthew Modine's tributes to Davis, click HERE.